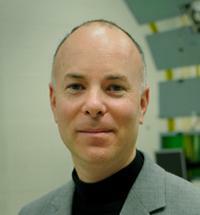 Keith Evan Green is professor in the department of Design + Environmental Analysis and the Sibley School of Mechanical & Aerospace Engineering at Cornell University. Green investigates how the built environment can behave more like living things in response to human needs and opportunities. Employing digital technologies and particularly robotics, Green's trans-disciplinary ARCHITECTURAL ROBOTICS LAB develops, prototypes, and evaluates cyber-physical environments and their components supporting and augmenting an increasingly digital society. Widely published in IEEE and ACM journals and proceedings, Green is the author of a new book for MIT Press, Architectural Robotics: Ecosystems of Bits, Bytes and Biology (2016). With frequent support of the U.S. National Science Foundation, Green strives to realize the kinds of cyber-physical systems that cultivate interactions across people and their surroundings that define places of social, cultural and psychological significance. Green earned a B.A. degree in Psychology and M.S. and Ph.D. degrees in Architecture from the University of Pennsylvania, and an M.Arch. degree from the University of Illinois at Chicago. He is a licensed architect and a senior member of IEEE. My research webpages offers links to my many publications (many downloadable), organized by research project, many of these NSF sponsored. Most recently, I am PI for home+ sypported by an award from NSF SCH (Smart and Connected Health; (NSF IIS-1601983, $593,218); my ARCHITECTURAL ROBOTICS LAB at Cornell University will collaborate with Co-PIs Ian Walker and Johnell Brooks at Clemson University to design, prototype, and test a suite of robotic furnishings supporting aging in place. Green, K. E. Architectural Robotics: Ecosystems of Bits, Bytes and Biology. Cambridge, MA: MIT Press, 2016. Wang, Y. and Green, K. E. Accepted. A Pattern-Based, Design Framework for Designing “Collaborative Environments.”InProceedings of TEI 2019, the Thirteenth International Conference on Tangible, Embedded, and Embodied Interactions(TEI 2019). ACM, March 17-20, Tempe, Arizona, USA. Bernard, A., de Aguiar, C. Green, K. E. 2018. Model for a Rigid, 3D Mechanism Inspired by Pop-Up Origami, and its Application to a Re-configurable, Physical Environment.In Proceedings of the 14th Conference on Automation Science and Engineering (IEEE CASE 2018), August 20-24, Munich, Germany, pp. 1146 – 1151. Threatt, A. L., Merino, J., Green, K. E., Walker, I. D. Brooks, J. O. and Healy, S. An Assistive Robotic Table for Older and Post-Stroke Adults: Results from Participatory Design and Evaluation Activities with Clinical Staff. In Proceedings of CHI 2014: the ACM Conference on Human Factors in Computing Systems, Toronto, Ontario, Canada, pp. 673–682. Soleimani, A., Herro, D., Green, K. E., and Walker, I. D. A Tangible, Story-Construction Process Employing Spatial, Computational-Thinking. Proceedings of IDC 2016: the 12th International ACM Conference on Interaction Design and Children, June 21-24, Manchester, UK, pp. 157-166. Houayek, H, Green, K. E., Gugerty, L. Walker, I. D. and Witte, J. AWE: An Animated Work Environment for Working with Physical and Digital Tools and Artifacts. In Journal of Personal and Ubiquitous Computing [JPUC], June 2014, Volume 18, Issue 5, pp. 1227–1241. Kapadia, A., Walker, I. D., Green, K. E., Manganelli, J., Houayek, H., James, A., Kanuri, V., Mokhtar, T., Siles I., and Yanik, P. A Novel Approach to Rethinking the Machines In Which We Live: A Multidisciplinary Course in Architectural Robotics. IEEE Robotics and Automation Magazine [RAS], 21(3) (September 2014): 143-150. Yanik, P.M., Merino, J., Threatt, A.L., Manganelli, J., Brooks, J.O., Green, K.E. and Walker, I.D. A Gesture Learning Interface for Simulated Robot Path Shaping with a Human Teacher. IEEE Transactions on Human Machine Systems, 44(1): 41–54, 2014. I am an award-winning, licensed architect (NCARB, SC) as well as a senior member of IEEE. As my lab members and I strive to impact the wellbeing and capacity of members of society through my research, my public outreach activities are many and wide-ranging. We invite people of all ages and capabilities to visit our lab and participate in workshops conducted inside our lab and outside our lab in our research test-beds and in other public venues. We are currently collaboarting with the Tompkins County Public Library, the History Center in Tompkins County, the Science Center, and Dryden High School. My teaching focus lies at the interface of Computing, Design, and Cognitive Science. I have degrees in two of these areas, and I teach and supervise undergraduate and graduate students in all three. My interdisciplinary teaching is the subject of benchmark papers for ACSA (architecture) and both ICRA and IEEE RAS (robotics). I aim to develop and deliver courses in Human-Computer Interaction and Design, or related foci such as Interactive and Intelligent Environments, User Experience, and Interaction Design. Underrepresented faculty and students flourish under my guidance. At University of Auckland (New Zealand) where I was first tenured, 100% of the students I taught were from outside the USA. At Clemson, where I earned tenure for a second time, students I supervised came from Rio de Janeiro, from Cairo, and from many cities within Iran, China and India. Irrespective of the origins of my students, I invite all of them to find their own voices in my classroom so that the course means something for them, and hopefully in the future, for society and our planet, as these designers come to design us a promising future. Link to my webpages on current and regular teaching. At Cornell I teach DEA 2730 Human Centered Design Methods and DEA 6210 Architectural Robotics (Fall semesters), and DEA 5210 Interaction Design Studio (Spring semesters). Previous to joining the Cornell faculty, I taught undergraduate and graduate courses in Architecture (architectural design, theory, and technology), in the interdisciplinary PhD Program in Planning, Design, and the Built Environment, and in Electrical & Computer Engineering. I supervised Ph.D., MS. and M.Arch. thesis students in all of these programs. For more on my current and regular teaching at Cornell, including syllabi and course materials, visit my academics webpage. M.Arch., University of Illinois at Chicago. Prior to joining the faculty at Cornell, I served as founding director of Clemson University’s Institute for Intelligent Materials, Systems & Environments (CU-iMSE) and founding director of Clemson University’s Digital Ecologies graduate certificate program. For two years, early in my career, I also directed Clemson University’s off-campus design program in Barcelona, Spain.